The great sportsman and a legendary boxer of the nineteenth century, Muhammad Ali has won the “Heavy-Weight Championship” thrice and was the only unbeatable American athlete who inspired African-American people not only by his remarkable performances but also with his humanitarian and altruistic ideas towards religion and politics. 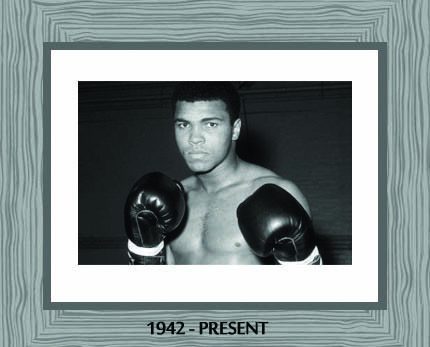 On January 17, 1942 this star was born in Louisville, Kentucky and was named as Cassius Marcellus Clay Jr. He was the elder son of Cassius Marcellus Clay Sr. and Odessa Grady. By profession his father was a sign painter but hugely admired acting, singing and dancing. His mother used to work as a cleaning lady to support her family at a high-time. Ali started playing boxing when he was just twelve. His God gifted talent was explored by his teacher Joe Martin, who by profession was a policeman and reported Ali’s bicycle theft complain. Martin encouraged Ali and helped him become a known athlete. At Louisville’s Columbia Gym, he worked hard on Ali and then featured him on a local television show titled “Tomorrow’s Champions”. Such platforms proved luckiest for Ali. Fred Stoner, a well-known trainer of Africa and America, taught Ali the real art of boxing. Though Ali compromised on his earlier studies and gave less to time to them, his boxing skills polished in a very short time span. Media gave a special position to the charismatic personality of Muhammad Ali while he participated in “World Heavy-Weight Boxing Championship”. Ali was a famous poet of his era as well. His poems were based on future victory predictions, and earned him the title of “The Louisville Lip”. Sonny Liston, an unbeatable American boxer, lost against Muhammad Ali for the first time in “Heavy-Weight Championship of the World”, February 1964. Ali was just twenty-two years old at that time. Next year, when Ali was fighting for his title defense against Sonny Liston in May 1965 he again defeated Liston in the very first round of the game. Last speedy and unforgettable punch by Ali in the same fight made him a superstar of boxing. During the struggle for Civil rights of African-American community, though Muslims were involved in many disputes, nonetheless they appeared to be of core importance. In the same era, Muhammad Ali (known as Cassius Marcellus Clay Jr. at that time), highly influenced by a Muslim spokesman “Malcolm X“, changed his name to “Cassius X”. After some time the famous Muslim leader “Elijah Muhammad” also changed his name to “Muhammad Ali” (beloved of Allah). In April 1967, Muhammad Ali faced a huge setback when the New York State Athletic Commission and World Boxing Association suspended his boxing license and his heavyweight titles were also taken back. The reason behind was his claim that he had no authority to serve as he was a Black Muslim Religion Minister. Press criticized him a lot, thus his image in the media ruined badly. Still, he stood like a rock on his religious beliefs and did not bow against opponents. He uses to say that he would happily give up his career, wealth, victories and entire future for the sake of religion. And will prove his strength of faith with dignity. Though the U.S. Court sentenced him with five years in prison, he was set free on appeal. Not only in boxing but also in every walk of life, Ali proved himself a solid rock. Upon his return to the boxing world, he gave marvelous entrance by defeating Jerry Quarry in 1970. A few months later, however, Ali lost to Joe Frazier. Ali and Frazier fought again in 1974 in New York City and in the Philippines in 1975, which Ali called the “Thrilla in Manila.” Ali had defeated Frazier in both matches thus regained his title as the “World Heavy-Weight Champion”. This was a huge success for Ali which brought his back in the glorious world of boxing as a tough opponent. Muhammad Ali gave a fresh turn to his series of victories with a new style “rope-a-dope.” Meanwhile his opponents use to wear themselves down; he used to rest against the ropes, preparing himself for an unbeatable performance in the next round. For ten times, Ali had won the title of “World Heavy-Weight Champion” till he got defeated by Leon Spinks in February 1978 in Las Vegas, Nevada. Still, Ali did not step back, and once again after seven months, he was the “World Heavy-Weight Champion” after defeating Spinks in New Orleans, Louisiana. His last fight was in 1981. He fought sixty-one matches in his awesome career. Unfortunately, Parkinson’s disease didn’t not let him play ahead as his nervous system got too weak. After the end of his boxing career, Muhammad Ali was actively involved in politics and social causes.